"The most challenging parts of life as a (gigging/touring blind) comedian for me are all of the logistical ones, travelling the country to different venues and even getting to and from the stage at a show," says Chris. "Obviously, I've found solutions to these aspects of the job over the years. Once these issues have been overcome the actual on stage, stand-up part of the job is the easy bit." From tales of the marathon birth from hell that Chris and his wife thought would never end, and their experience of having to pay actual money to a mad lactation consultant (yes that's a real job), to the numerous and inevitable conflicts that arise when a pasty white Scouser is married to a hot-blooded Brazilian woman..
Chris also gives an insight into life and parenthood in the dark, from his inevitable shortcomings as a husband who can't do his share of the driving to the total farce of playing hide and seek when you can't see where to hide or even where to do the bloody seeking! Q/ What's the most challenging part of being a dad for you? Chris McCausland: As my daughter has got older and more communicative, being a blind Dad has got easier in lots of ways. There was a really difficult period when she was a one-year old, where she was mobile but silent, crawling about on the floor but hardly making a bloody peep! Looking back, maybe I should have put a bell on her, or a bluetooth tracker so that I could ask Alexa to find her! Now she's five though, it's probably things like not being able to help her properly with her reading and her writing. How many of the other kids in her class have already got better handwriting than their Daddy? Q/ You're a northerner and your wife is Brazilian - how does that culture clash work out? Chris McCausland: As you can imagine, we are very different in terms of our culture, and our biological response to temperature. Whereas my wife will still require a winter coat in 22 degree sunshine, I struggle to function in anything warmer than about 26. This obviously creates a great deal of conflict when the central heating comes into question. I talk about this in the show, but I think there is a good chance that one of us may one day be found dead in the hallway with one arm reaching out towards the thermostat, with the other one of us having skipped the country. Q/ What has been your career high point so far? Chris McCausland: My career high point so far has definitely been filming Live at the Apollo for the BBC. Not only was it the biggest career opportunity that I have had, but it was also the biggest actual gig that I had done, getting to play in front of 3500 comedy fans at the Hammersmith Apollo. I have lived in London for over twenty years and have been to see lots of my music and comedy heroes perform on that stage, and so to get to do the same was a dream come true really. Q/ What projects have you got coming up? 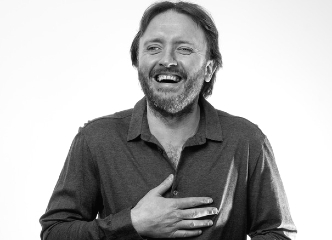 Chris McCausland: After this tour is over, I plan to write a book about my own experiences of losing my sight, being a comedian, and becoming a Dad. They say that everybody has got a book in them, and I reckon I must have at least two. I also plan to become Prime Minister, destroy Facebook, and form the world's most successful rock band. Chris McCausland: Speaky Blinder at Komedia Brighton on Thursday 13th June 2019. CLICK HERE for tickets.